TOTALLY JUST LIKE AVATAR KIND OF! 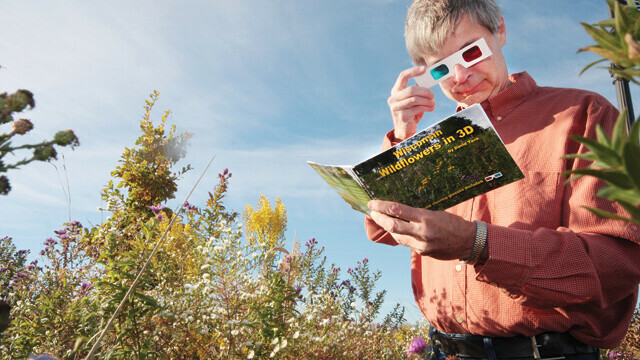 Stout professor David Tank eyes up his latest book: Wisconsin Wildflowers in 3D. It’s in three dimensions, like life. The 3D market is exploding. After the success of Avatar, filmmaking in 3D has practically become the norm. The technology is now also used in video games and television shows. Heck, even high-end spectacle makers are releasing fashion-forward (hipster) versions of the old cardboard 3D viewers in sunglasses form. And with UW-Stout professor David Tank’s newest project, Wisconsin Wildflowers in 3D, the phenomenon is expanding to books. I had some kids who ... were reaching out trying to touch the flowers, their fingers two inches from the page. ... It’s kind of fun to watch. Wildflowers is not just another field guide to Wisconsin’s flora and fauna; it’s like nothing we’ve ever seen before. The book contains 108 photographs, each including the plant’s common name, height, bloom time, and habitat, as well as interesting tidbits of information about many of the plants. Roughly organized by bloom time – starting with Wild Geranium and ending with Dotted Horsemint, the book includes flowers ranging from Catnip and dandelions to Queen Anne’s-lace, Labrador tea, and Pink Lady’s-slipper. All in 3D. The real magic of the book is in the glasses. When viewed through the 3D specs, you feel like you’re standing in a meadow, looking down at brilliant blue Wild Morning Glorys. There’s just an unreal amount of depth to every image, which tricks your mind into thinking you’re actually there, and that you could reach out and feel the texture of the plant. Tank has spent the last 20 years working with 3D photography, making old-fashioned stereo viewer cards, using two pictures strategically taken so they appear to pop off the page.